Last weekend was a busy one in New Brunswick. The runners were busy all weekend long with the Marathon by the Sea. The Marco Polo 5-km went to Steve Hanlon of Saint John in 19:55 for men and Marin MacPherson of Quispamsis for the women in 23:01. In the 10-km the women were led by Andree Germain of Granby QC in 41:37 and the men followed Scott lee of Baxters Corner who hit 39:51. The half marathon had a record breaking performance by Quispamsis runner Shelley Doucet who knocked the record back by over 2 minutes with a 1:19:22, that is a grand slam in the running world. Second place went to Megan McNear of Negley OH in 1:33:28 and third to Karen Kuzik of Saint John in 1:41:10. The men were led by Jean-Philippe Deschenes of Alma PQ in 1:18:39 ahead of Michel Colford of New Maryland in 1:19:39 and Colin McQuade of Riverview in 1:21:19. In the full marathon the men were very quick with Nicholas Bucker of Halifax on the top of the podium in 2:48:24 flanked by Matthew Fyfe of Sackville (2:49:10) in second and Trevor Funk of Saint John (2:52:14) in third. Belinda Ralph of Lavington NSW AU won the women’s marathon in 3:09:55 followed by Stella Chen of Wolfville (3:53:02) and Andrea Cameron of Toronto (3:55:32). The triathletes contested their Provincial championships in Harvey and the men’s Olympic event went to Alexandre Boule of Oromocto in 2:02:50 followed by Martin Larose of Oromocto in 2:14:57 and Bill Lane of Moncton in 2:23:23. The women’s winner was Laura Richard of Fredericton in 2:38:41 followed by Rothesay’s Sue Watson (2:46:21) and Bathurst’s Nathalie Boivin (2:49:53). The women’s sprint winner was Elizabeth Seiffert of Hanwell New Brunswick in 1:19:03 ahead of Addie Carten of Welshpool (1:31:20) and Lisa McCutcheon of Southampton (1:33:01). The men were led by Satish Punna of Moncton (1:10:59) followed by Michael Roy of Moncton (1:12:04) and Philippe Levesque of Edmunston in 1:13:40. In Caraquet Sacha Hourihan of Southfield took the 10-km in 38:04 for women and Jean-Marc Doiron was top male (34:55). Women’s 5-km went to Patty Blanchard of Dieppe (19:53) and Jerome Theriault of Paquetville (18:55). 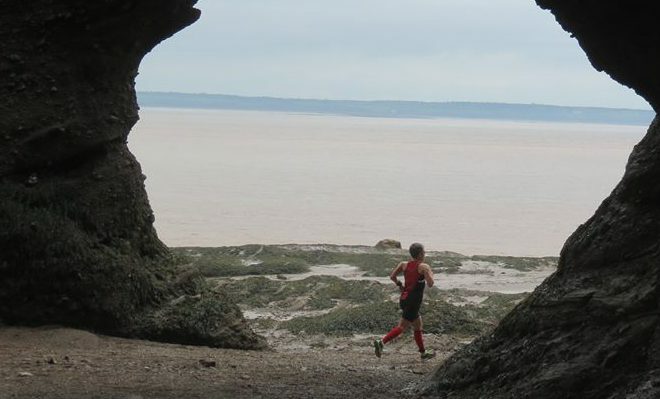 This week our Person on the Run goes to Elizabeth Seiffert of Hanwell. This triathlon legend is mounting a comeback after injuries and illness and is this year’s Provincial Sprint Champion. Great work.